Watford (/ˈwɒtfərd/ ( listen)) is a town and borough in Hertfordshire, England, 15 miles (24 km) northwest of central London. The town developed on the River Colne on land belonging to St Albans Abbey until the 16th century. During the 12th century a charter was granted allowing a market, and the building of St Mary's Church began. The town grew partly due to travellers going to Berkhamsted Castle and the royal palace at Kings Langley. 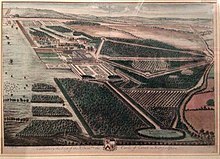 A mansion was built at Cassiobury in the 16th century. This was partly rebuilt in the 17th century and another country house was built at The Grove. Connecting with the Grand Junction Canal in 1798, and the London and Birmingham Railway in 1837, allowed the town to grow more rapidly with paper-making mills, such as John Dickinson and Co. at nearby Croxley, influencing the development of printing in the town. Two brewers, Benskins and Sedgwicks, amalgamated and flourished in the town until their closure in the late 20th century. Hertfordshire County Council designates Watford to be a major sub-regional centre. Several head offices are based in Watford. Both the 2006 World Golf Championship and the 2013 Bilderberg Conference took place at The Grove. These developments gave the town excellent communications and stimulated its industrial growth during the 19th and 20th centuries. The Grand Union Canal, allowed coal to be brought into the district and paved the way for industrial development. The Watford Gas and Coke Company was formed in 1834 and gas works built. The canal allowed paper-making mills to be sited at Croxley. The John Dickinson and Co. mill beside the canal manufactured the Croxley brand of fine quality paper. There had been brewing in Watford from the 17th century and, by the 19th century, two industrial scale brewers Benskins and Sedgwicks were located in the town. The parish church of St Mary's was extensively restored in 1871. The town expanded slightly during this time. In 1851 a new street off the High Street was opened, King Street, followed by Queens Road and Clarendon Road in the early 1860s. During this time, Watford had a population of around 6,500 The railways also continued to expand from Watford during this period; the Watford and Rickmansworth Railway opened in 1862 as a short branch line via Watford High Street to Rickmansworth (Church Street), and another branch was added to Croxley Green in 1912. The original plan was to extend the Rickmansworth line south connecting Watford to Uxbridge; this scheme failed and both the Rickmansworth and Croxley branches closed. Watford's population had risen to 17,063 by 1891 to become very cramped. Local landowners sold land for the development of the town and it was bought up by commercial interests. Various factories and other works sprung up in Watford, mostly breweries and prints, but also engineering works, a steam laundry, a cold storage company and a cocoa processing plant. The town expanded rapidly, most of the new inhabitants moving in from London. At the start of the 20th century the town was growing fast. New roads were laid out in Callowland, North Watford, and in West Watford on farmland. Many continued to live in the cramped and unsanitary houses in the yards and alley-ways opening off the High Street. Some of these people were among those who rioted in 1902 when the celebration for King Edward VII's coronation was postponed. The Council had a programme of slum clearance which stopped with the outbreak of World War I in 1914. Building council houses resumed after the war and in the 1920s the Harebreaks estate was developed. The Pump House Theatre and Arts Centre is based in an old pumping station situated just off the Lower High Street. The building was converted for use as a theatre, with rehearsal rooms, and meeting place for local arts based groups. Current facilities include a 124-seat theatre, rehearsal rooms, and live music venue. Community groups currently meeting at the Pump House include Dance House (children's ballet), Pump House Clog Morris (women's Morris dancing), Pump House Jazz (jazz club), Open House (live open mic music), Woodside Morris Men (men's Morris dancing), child, youth and adult theatre groups and also the Giggle Inn comedy club. In 2018, the venue hosted the inaugural Watford Short Film Festival alongside Watford Museum. Watford tube station is the terminus of the Watford branch of London Underground's Metropolitan line. The station is located outside the centre of Watford, close to Cassiobury Park. In 2013 the Croxley Rail Link project was approved to extend the London Underground Metropolitan line to Watford Junction by reinstating a stretch of the former Watford and Rickmansworth Railway. As part of the scheme, Watford Metropolitan station would have closed to passengers and been replaced by new stations on the reopened route at Cassiobridge and Watford Vicarage Road. The project did not go ahead due to funding problems. In August 2014, the transport secretary Patrick McLoughlin indicated that the government was actively evaluating the extension of Crossrail as far as Tring, with potential Crossrail stops at Wembley Central, Harrow & Wealdstone, Bushey, Watford Junction, Kings Langley, Apsley, Hemel Hempstead and Berkhamsted. This proposal was subsequently shelved in August 2016 due to "poor overall value for money to the taxpayer". Watford town centre and the surrounding area is relatively compact and the terrain is generally quite flat. Over 9 miles (14 km) of new cycle routes have been developed in the town since 2003 and a range of cycle maps are available locally. In Watford cycling to work makes up 2.2% of all journeys compared with 1.6% across the whole of Hertfordshire. ^ Virgil. Aeneid. pp. VI, 95. Tu ne cede malis, sed contra audentior ito , translates to "Yield thou not to adversity, but press on the more bravely". ^ a b "Watford Monitoring Report 2017" (PDF). Watford Authority Monitoring Reports. 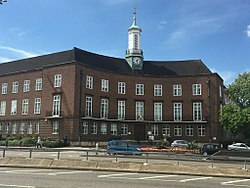 Watford Borough Council. pp. 21–22. Archived (PDF) from the original on 13 November 2018. Retrieved 13 November 2018. ^ a b c d Mary Forsyth (1 December 2008). T. R. Slater, Nigel Goose, ed. A County of Small Towns: The Development of Hertfordshire's Urban Landscape. Univ of Hertfordshire Press. Retrieved 29 January 2013. ^ a b William Page (1908). "Watford". A History of the County of Hertford: volume 2. pp. 446–451. Retrieved 27 January 2013. ^ William Page (1908). The hundred of Cashio - Introduction | A History of the County of Hertford: volume 2 (pp. 319-322). british-history.ac.uk. Retrieved 29 January 2013. ^ a b William Page (1908). "Watford: Manors". A History of the County of Hertford: volume 2. Victoria County History. pp. 451–464. Retrieved 19 May 2008. ^ "Coronation celebration postponed". Archived from the original on 7 April 2014. Retrieved 2 April 2014. ^ 2011 Census: Usual resident population and population density, local authorities in the United Kingdom, Accessed 8 January 2012. ^ Twinning Archived 11 January 2008 at the Wayback Machine, Watford Borough Council, accessed 12 October 2007. ^ a b Scarbrough, Paul (6 March 2009). Acoustical Survey Report for the Watford Colosseum (PDF). Akustiks. Archived from the original (PDF) on 8 June 2013. Retrieved 9 February 2013. ^ "Watford Tube extension approved". BBC News. 24 July 2013. Retrieved 7 November 2018. ^ "Croxley Rail Link". Transport for London. Archived from the original on 25 March 2013. Retrieved 8 August 2013. ^ "Watford Tube extension in doubt, MP says". BBC News. 2018. Retrieved 7 November 2018. ^ a b Moving On – Applying for a Secondary or Upper School place Archived 16 May 2008 at the Wayback Machine, Hertfordshire County Council, 2007. ^ Admissions Update 2007 Archived 24 September 2015 at the Wayback Machine, Agenda Item No. 4, Hertfordshire County Council Admissions Forum, 14 June 2007. ^ They Shaped the Club Archived 3 December 2008 at the Wayback Machine", Watford F.C. History, 3 February 2008.